Kisu is not terribly big or prestigious, but so many people are crazy about them here because catching them is fun (they pull pretty hard for their size) and they taste so good. The fresh ones are great when sliced raw as sashimi and wonderful when used for sushi, but they are simply EXCELLENT when batter-fried with shiso(perilla) leaves! So, ever since I took up fishing a few months back, I had dreamed about making tempura with the fresh kisu I caught. Yes, I had made tempura with store-bought kisu several times before and I knew its taste. But making it with my own catch is the special part, you know. I really want to experience the “pull” that so many anglers talk/write about. And catching kisu is not like catching sardines in a dirty port. You go to a clean beach and will be surrounded by the sound of the wave. And you throw weight and bait towards the beautiful horizon where the blue ocean and the sky meet. When you do catch some, they are fresh from the Pacific Ocean -- hence, no worry about the pollution. Mmmmm… I like that. I like that very much. That’s the kind of fun I want to have in summer -- or in any season, if possible! But in this summer heat, I can never fish around and after noon. So my fishing trip has to be early in the morning on my day off, and to be at the beach in time, I have to leave home TERRIBLY early in the morning. Hahaha… BTW, I had my bicycle repaired so it doesn't wake up the whole neighborhood with its squeak any more. ;) The shot above is the one I took this morning when I came near the beach. And this shot is for those who missed the sunrise today. It was gorgeous. I guess it is an early-bird angler’s privilege to be able to enjoy a view like this. To be honest, this photo above is from my last fishing trip. This blue rod is the one I broke a week ago before it caught any kisu. Now I have an orange-colored fishing rod which is a little longer than this blue one. Finally!! (The fish is not floating in the air. I caught but released several fish that I didn’t want to keep, and these were the only two I brought back home after all. I know. What a meager catch for all the efforts and preparations and crazy, long bicycle ride! But the important thing is -- I enjoyed all the craziness and my small dream actually came true! And that is much, MUCH better than spending the whole day off in my messy room, thinking that I'm too old to have any fun. Thank you so much for the pictures! I wish I could travel to Shikoku. It seems like such a nice part of Japan. Do you always wake up early, even on days you don't go fishing? Was it hard to clean the fish before frying them? 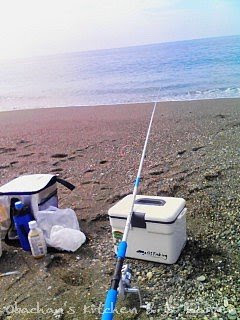 Oh wow, I want to go kisu fishing at the crack of dawn too! I sense a "fishing blog" in the works. Nice exercise, though, bicycling. I've never been to shikoku. Love the photos! Oishisou~! Great pictures, the fish and shiso tempura looks wonderful. And yes, fishing on the beach beats staying home! Obachan: I too love fishing so I can appreciate your passion. Your Kisu and the other fish (some kind of mackeral?) look great. I can understand why you only kept these two. Yep, Shikoku is a nice rural place. I have to get up early on my work days,too, because my work starts at 6:30 AM or 7:00 AM. So, for me getting up early for something I love to do is not hard at all. No, it wasn't hard to clean the fish because there were just two of them. Seriously? Well, it's nice to know that I'm not the only one. Thanks. Thank you. BTW, kisu tempura can be a great bento food, too. I guess you can catch kisu in Hawaii, too, right? Thanks. Actually kisu fishing is popular everywhere in this country-- it doesn't have to be in Shikoku. 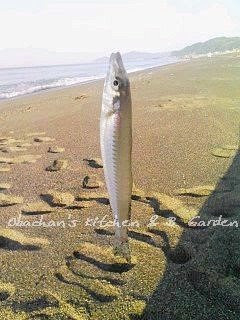 After the rainy season, you see so many anglers fishing kisu (and other fish) on sandy beaches througout Japan. Oh I'm so glad to hear from someone who shares the same passion. The other fish is probably a (very) young yellowtail or Japanese amberjack. I was surprised because I thought they would never come close to the beach. 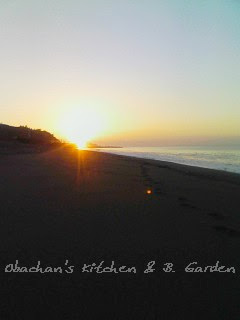 I'm not too sure what the name is in Hawaii, Obachan, so I'm not too sure if we can catch it in Hawaii. I'm jealous of your fishing ability. And I agree with you about going out and having fun, making a small dream come true. So often I dream about doing something simple and fun, but then think "it's too weird" or "I don't have time". I like your style of just going out and doing it! It feels funny to call you obachan since I think I'm your senior, but wanted to let you know that I love your spirit. Not just your love of cooking, but your determination and ki for kisu. The tempura looks gorgeous. Tempura is one cooking I am totally lacking. Mine always comes out too greasy for my taste. Maybe I'll never get it right as long as I live. Then again after reading your post, I just need to spend a whole day in my kitchen making tempura one by one until I can perfect it. Thanks for your lift! I've been to Shikoku almost 6 years ago with my mother when she was still living. We tried to do the walk, but because my mother was already in her 70's, we only made 3 temples. Although we were there for 4 days, I don't think I saw much of Shikoku other than Matsuyama. Since I'm retired now I will be returning to Japan often and have to properly visit Shikoku again. This was such a gorgeous post on so many levels... the sunrise photo, the floating fish, and the final tempura... you have many amazing talents!